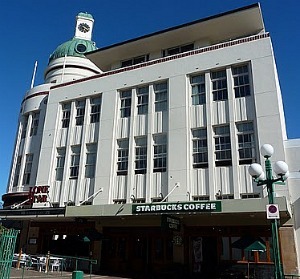 Art Deco Building - Napier Starbucks! 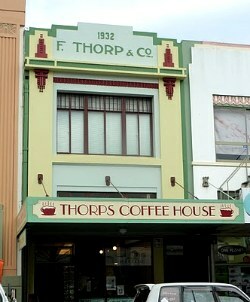 My friend Fiona from London sent me these photos recently of her trip to Napier in New Zealand. This town has the largest group of Art Deco buildings in one place in the world. The reason for this was an earthquake in 1931 which destroyed the town. 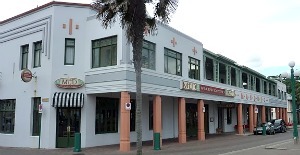 Because the whole town was rebuilt in the 1930s in the style of the day, almost all the buildings are Art Deco. 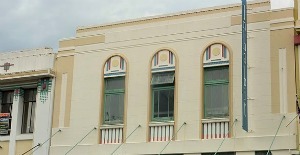 There are many examples of the streamlined look, and lots of buildings have sign boards with typical Art Deco fonts. Its a really special town. Thanks Fiona. I'm off to the Art Deco Festival they hold in Napier every February. This is the first year I'll be going and I'm really excited. They hold lots of parties, events, dances, picnics, vintage car rallies, concerts, movies and more. It looks like I'll be exhausted by the end of it! Check out this link and I'll post lots of information once I've been. Return to Art Deco City.